Journeys with an Apostle – Magical Mystery Tours – A Greek Odyssey? Troas: Paul raises the dead – and then leaves? Alexandria Troas (modern Eski Stanbul/ Dalyan) – where a young lad called Eutychus was raised from the dead by St Paul. The boy was so bored by Paul's endless sermon that he fell from a third floor window and died. Fortunately, the apostle went down, "fell on him" and all was well – Acts 20.5,12. Oddly, the apostle never bothered with a mission in this major port – so unlike the lavish attention he supposedly gave to Corinth. Roman Troas (Colonia Alexandria Augusta) was a city of over 1000 acres within 5 miles of walls. "One of the most notable cities in the world", said Strabo (Geography, 13.1.26). Emperor Constantine considered making Troas his capital before settling on Byzantium. The site remains largely unexcavated. "Tradition" says this is the ruin of Paul's prison (where he passed one night's confinement!). But archaeology says that's nonsense, it's a Roman water cistern! Don't tell the gullible tourists! Philippi is actually most notable for the battle between Antony and Octavian and the assassins of Caesar, Brutus and Cassius, in 42 BC. Antony carried the day. After the battle the city became a Roman colony. In the early 20th century the Greek Orthodox Church built a shrine to Paul's "first convert in Europe" (the Lydia of Acts 16.14) – slap in the middle of the ancient battlefield. Well, as good a place as anywhere else! Paul did not fancy his chances against the Epicureans and the Stoics of the great city, even though they offered to listen. (Acts 17.19; 32). He told the Athenians they were "too superstitious" – a remarkable charge from the man who claimed to hear the voice of a god! Paul settled for the simpler folk of Corinth – and got an encouraging message from Jesus into the bargain! (Acts 18,9,10). "For all the Athenians and strangers which were there spent their time in nothing else, but either to tell, or to hear some new thing." Christianity of course already knew absolute truth so what need of scientific enquiry? This grant I make not only for the sake of the petitioners, but as judging those Jews for whom I have been petitioned worthy of such a favour, on account of their fidelity and friendship to the Romans." Acts 19.19. Paul officiates at the burning of books at Ephesus. The apostle had filled "all the Jews and Greeks with fear" (Acts 19.17) and delighted the simple-minded by handing out handkerchiefs that "expelled evil spirits" (Acts 19.12). All a fiction – but it set the tone for the centuries that lay ahead. The Christians toppled the images of "the demon Artemis" in the 5th century. Portrait of St Paul, Ephesus? Don't get excited. The cave images are no earlier than 6th century. Pity archaeologists can't find those magic hankies with which Paul expelled evil spirits. Separating his converts from the local synagogue, it seems Paul disputed daily in the "school of Tyrannus" (Acts 19.9). If Tyrannus was a Greek philosopher then he is entirely unknown. On the other hand, Sophocles wrote a play Oedipus Tyrannus in which a messenger arrives from Corinth with the "good news". Did the Ephesian silversmiths need to worry! In Ephesus, "the whole city" (well, it would be of course, this is a Christian showman at work) was "filled with confusion" by Paul's attack on religious icons. The silversmiths were in uproar that their livelihood was in peril. "Paul hath persuaded and turned away much people, saying that they be no gods, which are made with hands." – Acts 19.26. A pity that the apostle did not have the power of prophecy. He might have foreseen the vast trade in Jesus trinkets that would fill the centuries ahead! Corinth: Jews get blood warning – and Paul meets Gallio? "He shook his raiment, and said unto them, Your blood be upon your own heads." – Acts 18.6. Unlikely. Acts 18.12,17 reports that the angry Jews of Corinth brought Paul to the bema or "tribunal", a platform that stood on one side of the forum, there to be judged by the proconsul Gallio. Eighteen centuries later Christian apologists seized on the reference to Gallio to date their wandering preacher and built the entire edifice of New Testament dating upon it. Scam still works – after 2000 years! Paul used these for the sick. and the diseases departed from them, and the evil spirits went out of them. These cloths can be used in the same matter for the sick, for deliverance, plus more. Blessed by God, through our Pastor." "For though I be free from all men, yet have I made myself servant unto all, that I might gain the more. And unto the Jews I became a Jew, that I might gain the Jews ... To them that are without law, I became outside the law ... that I might gain them outside the law ... To the weak I became as weak, that I might gain the weak. I am made all things to all men, that I might by all means save some." – St Paul, 1 Corinthians 9.19,22. According to the story in Acts, following St Paul's successful mission to Cyprus and Lycaonia, the apostle made two extensive evangelising tours across the Greek world. The conventional dating for the journeys is sometime during the 50s or 60s of the first century, with each tour lasting two or three years. Acts records the apostle's presence at major cities like Athens, Thessalonika and Ephesus and also at minor towns like Derbe and Mitylene unmentioned by Paul himself. Paul's own epistles actually confirm very little of the grand tour. Curiously, Acts makes absolutely no reference to the seminal letters which, apparently, were one consequence of Paul's magnificent missionary effort as he struggled to encourage and discipline the fledgling churches. Paul's adventures are chock-full of miracle, magic and myth – but are they history? "Let us go again and visit our brethren in every city where we have preached the word of the Lord, and see how they do." After a blazing row with Barnabas ("contention so sharp"), the intrepid apostle Paul set out with new man Silas on his supposed second missionary tour. Silas was the "chief man" and "prophet" selected by the elect of Jerusalem to reassure Gentiles that circumcision was unnecessary (Acts 15.22,32). Apparently, like Paul, he also was a Roman citizen (Acts 15.37) – a highly improbable status, given the privileged nature of Roman citizenship at such an early date. Paul in his own writings makes no mention of a Silas but a Silvanus does show up as co-author of 1 and 2 Thessalonians and this may refer to the same character. Even then, Paul confirms nothing of "Silas" as a co-missionary. One assumes the dynamic duo took an overland route, through Tarsus and the Cilician Gates, to reach the first mentioned stopover, Derbe, then on to Lystra where Timothy joined the party (sans foreskin). 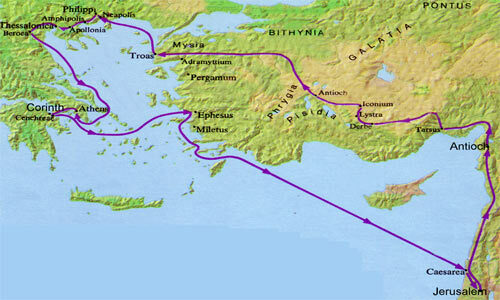 Passing uneventfully "throughout" Phrygia and Galatia, spirit divinities "forbade" any foray either south into Asia Minor or north into Bithynia (Acts 16.6,7), so instead the happy band entered the province of Mysia on the Bosphorus and the major city of Troas. Oddly, Paul had no interest in evangelising in this major city. He preferred to respond to his "vision in the night" and chance his luck in Philippi, a city one tenth the size which did not even have a synagogue, normally his first port of call. Supposedly, Paul first encountered Luke at Troas – a desperate way of explaining the curious "we" passages in Acts 16.10 to 16.16. But if Luke really was part of a "we" why does he not identify himself? Why is he such a passive and invisible "evangelist"? And why does he drop out of the party at Philippi, so soon after joining? From chapter 17 the writer reverts to "they" rather than "we" for all of Paul's adventures in Thessalonica, Athens and Corinth. Even more bizarre is that "us" reappears at Acts 20.5, on the return leg of Paul's purported third missionary journey, when a whole gaggle of the brethren rendezvous at Troas. Did Luke really pass at least four years at Philippi, communing with Jesus and letting Paul do all the hard work elsewhere: the "year and six months" Paul worked in Corinth (18.11); the "two years" and a "season" that Paul tarried at Ephesus (19.10,22) and the "three months" the apostle spent in Greece (20.3)? And yet Luke is able to record all the colourful events of Paul's alleged mission? The whole scenario is quite unconvincing, particularly as Paul himself does not confirm Luke's arrival, presence or departure in any significant way. It is quite damning of Luke's authorship of the yarn in Acts that Paul mentions "the doctor" just three times – and then only in passing. St Paul's Greek island cruise – his supposed "Second Missionary Journey" (Acts l5.36-18.22), is variously dated between 49 and 52 AD. A third journey is reported, which follows the same route but for calling at Ephesus on the way out rather than on the way back (Acts 18.23-21.16). Why does Paul eschew the heavily populated and flourishing cities along the coasts of Pamphylia and Lycia for minor inland towns like Antioch in Pisidia and Lystra? Too much competition on the coast – or is the whole tale a fable?
" I AM telling the truth! I am NOT lying! A teacher of the true faith to the Gentiles!" More than a hundred cities populated the Roman world between Syria and Spain, so why did Paul choose the cities he did? Derbe and Philippi rather than Side and Pergamum? Lystra and Miletus rather than Sardes and Smyrna? The drama smacks of the tale of JC himself, for the most part played out in small towns with little trace and just "set pieces" performed in major cities. How likely is it that the "Holy Spirit" intervened to stop Paul evangelising in Asia Minor, the "Spirit of Christ" intervened to stop him evangelising in Bithynia, and then a "vision of a man from Macedonian" pleaded with him to evangelise in Macedonia? (Acts 16.6,9). Were the citizens of Roman Asia and the Bithynians less deserving than the Greeks – or is it simply that the story teller needed to get his hero into the heart of the Greek world? How likely is it that the great missionary traipsed all the way from Galatia to Troas – a journey of over 400 miles and on foot over difficult terrain taking perhaps two months, without founding any churches? Wasn't that what he was supposed to do? And then, when he finally reached the city of Troas, he promptly left for Macedonia? According to Acts, in Macedonia at Philippi Paul upset the Roman managers of a "damsel" who had the power of soothsaying. It seems she had accurately identified Paul and Silas as "showing the way to salvation" (Acts 16.17). Even so, Paul decided to expel the girl's guiding spirit (despite identifying prophecy as a "spirit gift" from God in his own epistles – e.g. 1 Corinthians 12.1,10). With a ruined business, the angry purveyors of prophecy drag Paul and Silas before magistrates for "un-Roman activity". The duo are flogged and jailed. That same night, an earthquake, no less, freed them from the stocks and conveniently opened all the doors of the jail (without bringing down the roof?). The jailer promptly became a Christian (conversion required only a bit of magic in those days.) Perversely, Paul did not mention that he was a Roman citizen until the morning. The petulant apostle then refused to leave his cell until the worried local magistrates asked him nicely. How likely is it that Paul, a Jewish tentmaker, happened to find employment in Corinth with two other Jewish tentmakers? (Acts 18.2,3). Paul's letters merely acknowledge Aquila and his wife Priscilla as "fellow workers in Christ Jesus" (Romans 16.3). Nowhere else does Paul seem bothered to get a job. "As for the Jews, who had again increased so greatly that by reason of their multitude it would have been hard without raising a tumult to bar them from the city, he did not drive them out, but ordered them, while continuing their traditional mode of life, not to hold meetings." The Christian fraudsters have almost certainly concatenated the earlier expulsion of Jews by Tiberius (Josephus, Antiquities 18.3) with the later restrictions of Claudius. It is rather interesting that Josephus preserves an edict of toleration issued by Claudius which redressed the anti-Jewish antics of his assassinated predecessor, Caius Caligula. The assassin? Josephus tells us the name in the preceding paragraph: none other than a man called Aquila! "But all agree that Aquila gave him the finishing stroke, which directly killed him." – Antiquities 19.1.14. Paul survives the beasts at Ephesus? Unknown to Acts, but Paul himself claims to have survived the beasts in Ephesus – an amazing outcome for an amateur bestiarii.
" If after the manner of men I have fought with beasts at Ephesus, what advantageth it me, if the dead rise not? let us eat and drink; for to morrow we die." Perhaps the apocryphal Acts of Paul supply the answer. In the arena the apostle apparently confronted a wild lion that he had baptised not long before! Paul thereupon had a friendly chat with the talking lion; meanwhile, the Almighty unleashed a hail-storm onto the spectators, killing many. How likely is it that Paul "fought with beasts at Ephesus"? (1 Corinthians 15.32). Apart from the improbability of his surviving (and with all his limbs intact! ), if Paul really was a Roman citizen he could not legally have been condemned to fight wild beasts. After all, we are later told that Paul used the "I am a Roman" plea before Festus to get his case transferred to Caesar in Rome (Acts 25.10). How likely is it that Paul caused a "riot of Ephesian silversmiths"? (Acts 19.23,41). How likely that "the whole city was filled with confusion", "rushed with one accord" into the theatre, chanted "Great is Diana of the Ephesians" for two hours and then had no idea why they had assembled? ("the assembly was confused: and the more part knew not wherefore they were come together.") In a familiar pattern, a figure in authority vindicates Paul as guiltless and dismisses the assembly! Some riot!
" And when Gallio was the deputy of Achaia, the Jews made insurrection with one accord against Paul." Gallio, we are told, dismissed the complaint out of hand, without Paul saying a word. Yet it seems rather doubtful that the non-existent case would ever had come to the attention of such a powerful man, the ruler of the whole of Greece. In the first half of the 1st century his brother Seneca was one of the richest men in Rome. The official career of Gallio, brother of the grand master of Stoicism and "prime minister", would have been common knowledge, even in the 2nd century world of "Luke." In this Corinthian episode, the purpose is to demonstrate the idle indifference of a Stoic imperial agent. Paul is released, the chief rabbi gets beaten up by Greeks, "And Gallio cared for none of those things." Too true. "Nor did I go up to Jerusalem to see those who were apostles before I was, but I went immediately into Arabia and later returned to Damascus. Then after three years I went up to Jerusalem." Paul has nothing to add about his stay in Arabia, nor does he say anything of the great Arab cities, like Gerasa, Suweida or Canatha. But then in Acts, Arabia does not get a mention at all. Did Paul really travel 20.000 kilometres? (Stoughton, p88). For all the plethora of attributed letters, Paul actually provides precious little information on "missionary travels" and not one of the epistles can be accurately dated. Acts mentions some thirty-odd towns on the Paul itinerary yet the apostle himself fails to mention over half of them and he rarely confirms his presence anywhere. The letters (assuming for the moment they are not all fake) could have been written by a wandering preacher. Equally, they could all have originated in a single centre, such as Ephesus, and subsequently have been edited to crudely fit the meanderings set down in Acts. Did Paul really evangelise in Galatia (a quite primitive region of central Anatolia populated by Gauls)? How likely is it that an itinerant Jewish preacher could have wandered into an unfamiliar town, preached to an indigenous people who spoke an alien tongue and who were steeped in the rituals of their own ancient religion, and soon after depart leaving behind a "church" to which he would send letters in polished Greek on the finer points of redemption? "How Paul got his message across remains a mystery, because there would have been little or no common ground on which to build. I can only think that it was the compelling force of his personality as he spoke with burning fervour about Jesus as the saviour of the world." – Murphy O'Connor, Paul, His History, p59. Perhaps Paul spoke slowly and loudly and handed out beads and mirrors? To avoid the problem entirely apologists redefine Lycaonia as "south Galatia", keeping the apostle in "safe" territory. In order to preserve a tenuous compatibility with the yarn in Acts, all the letters are necessarily slotted into a few years at the end of the apostle's purported life. Thus, the Epistle to the Galatians, for example, is traditionally ascribed to the year 60 and is said to have been written from Corinth. Though interesting for the partisan view it gives of the conflict with rival "Judaizers", the letter gives few clues to its provenance. A summarised career of Paul in verses 1.15-2.14 fits badly with the tale in Acts: "separated in the womb"; a "three year" sojourn in Arabia and Damascus; foray into Syria and Cilicia; unknown "by face" in Judaea; companionship of Titus; conflict with the Jerusalem apostles. The best one might say is that the references to "three years" and "fourteen years" probably puts the composition late in the writer's career. "I have been much hindered from coming to you. But now having no more place in these parts, and having a great desire these many years to come unto you; Whensoever I take my journey into Spain, I will come to you ... But now I go unto Jerusalem to minister unto the saints. For it hath pleased them of Macedonia and Achaia to make a certain contribution for the poor saints which are at Jerusalem ... When therefore I have performed this, and have sealed to them this fruit, I will come by you into Spain." Not only is it curious that the writer says he has "no more place" (that is, for missionary work) – scarcely true of pagan Greece – he also refers to having preached in what is now Croatia, again a region unmentioned in Acts. "From Jerusalem, and round about unto Illyricum, I have fully preached the gospel of Christ." – Romans 15.19. Another major letter, the 1st Epistle to the Corinthians purports to have been written at Ephesus (16.8), with Paul on this occasion anticipating a visit to Corinth, by a route "passing through Macedonia". He expresses a wish to over-winter in Corinth, and then receive help "whithersoever I go" (16,5,6). The intended route is bizarre, ignoring the obvious sea crossing from Ephesus to Corinth. Is this trip part of the third journey of Acts? Paul claims to have ordered a collection for the saints in Galatia (16.1), similar to the one he now orders in Corinth, yet he never returns to Galatia to collect. Perhaps he already has the saints' loot, but then, is he really planning such a hazardous and convoluted journey with one collection of money in order to pick up another? "Now when I went to Troas to preach the gospel of Christ and found that the Lord had opened a door for me, I still had no peace of mind, because I did not find my brother Titus there. So I said good-by to them and went on to Macedonia." "We had previously suffered and been insulted in Philippi, as you know, but with the help of our God we dared to tell you his gospel in spite of strong opposition." This could be perceived as confirming the "flogging", the "night in the stocks" and the "miraculous earthquake" alleged by Acts – in which case we must believe that Paul not only communed with the divine, but also was a master of understatement! Whilst a missionary journey, in the manner of a wandering sage or peripatetic philosopher, is intrinsically plausible of early day Christians, the Pauline journeys, characterized by incongruities, contradiction, and the absurd, are not. In the concocted fantasy, whole cities, even provinces, are in turn, enthralled and enraged by the activity of the pioneers of the one true faith. Yet in truth, the world scarcely noticed the first stirrings of a handful of Jewish heretics or the speculation of a few pagans infatuated with Mosaic law and the musings of the Hebrew prophets. The modest efforts, and limited successes, of early 2nd century Christian sects were amplified and encouraged by a "foundation myth" of world-shaking dimension. The Christian scribes of the 2nd century who wrote the New Testament needed to justify their own claims to eminence by the creation of noble "predecessors" who had shone like stars in a supposed apostolic golden age and had "passed on" the divine message. They confessed not to the fabrication of myth but to the inheritance of sacred testimony. To be sure, an element of truth – incidental detail and "famous names", gleaned from the works of secular authors – is preserved in the sacred texts, but in all other respects the sham history overflows with bogus nonsense. The two prima donnas of the Christian drama, Peter and Paul, are not merely more than human, they are not even human: they are phantoms of theological purpose. They are also rivals. Pious fraud seldom favours a monopoly of invention and in the 2nd century "golden age" of Roman peace and tolerance, any number of ambitious priests contended for popular acclaim and earthly reward. The candidate of the Roman ecclesiasta, St Peter, was promoted as the pre-eminent apostle in response to the challenge of the Asiatic school of soothsayers and their apocryphal traveller St Paul, who, like Mercury, was a messenger from the gods (and Paul is so-named in Acts 14.12!). Peter was accorded none of the trials and tribulations which tested the mettle of Paul ("in stripes above measure, in prisons more frequent, in deaths oft. Of the Jews five times received I forty stripes save one", etc., etc. 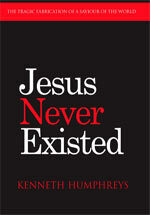 – 2 Corinthians 11) but instead was especially favoured by the transcendent, beginning with a divine appointment by JC himself (Matthew 16.18). No baying Jews after the blood of this guy! Peter is a simple hero, suited to those enamoured of the miraculous and impatient of hair-splitting theology. Thus, when Peter, like Paul, was briefly imprisoned, it was an angel of the Lord who arrived to effect his release – not a battalion of Roman troops! (Acts 12.7,10). For Peter, none of the closely argued "rules on food" of Romans 14. Instead, a great sheet descended from the sky full of "beasts and creeping things"’ and God himself boomed out "Rise, Peter; kill, and eat." (Acts 10.9,16). Though Paul lays claim to be "apostle of the Gentiles" in contradistinction to Peter, the "apostle to the circumcised", nonetheless it is Peter who converts the first Gentiles (Acts 10.48) and it is Peter who performs the first apostolic miracle. In Lydda, merely the shadow of the great man heals a "multitude" (Acts 5.15,16) and by curing a single sufferer of palsy (Acts 9.33,35) Peter converts the entire town, as well as all the residents of the plain of Sharon. What a star! But "Peter" was no great theologian (any more than his creators in Rome!) and "Paul" had written a body of theological doctrines and correctives useful in the practical struggle of establishing a church universal. And whereas Peter's "missionary activity" did not venture further than Joppa and Caesarea, barely 40 miles from Jerusalem, Paul's journeys went far and wide. Everywhere, the thirteenth apostle had met the violent hostility of "the Jews", and the caprice of the high and mighty, with the unyielding truth of Christ. No challenge was too great for this guy. In the furious 2nd century wrangle for "orthodoxy", the valuable theological legacy of "Paul" was sequestered for the greater Catholic cause. A journey to Cyprus? A mission to Galatia?